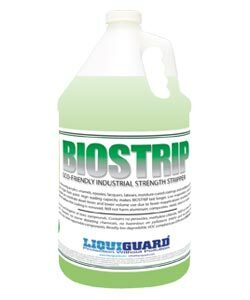 BioStrip is a highly effective paint stripping system that contains eco-friendly, non-hazardous ingredients. It’s an excellent alternative to low flash point materials that contain harmful ingredients including peroxides, methylene chloride and NMP; an acetone that is commonly used for stripping applications. BioStrip does not damage surfaces such as aluminum, concrete, metal, steel, wood and other composites. This unique product contains 15% bio-renewable carbon and its high loading capacity allows it to last longer, and be altered and rescued. Will not harm aluminum, composites, concrete, metal, steel or wood. Contains no carcinogenic or toxic compounds. VOC compliant per EPA and CARB regulations. Application for flat or vertical surfaces: Apply 1-2 mils of stripper to substrate. Allow sufficient time for paint to lift off. Remove with a plastic paint scraper. Typically, a dwell time of 45 to 60 minutes is sufficient for waterborne 2-part urethanes and other coatings. Dwell times needed to remove coatings are dependent on the coating’s thickness, type and age, as well as the porosity of the surface. A second stripper application may be necessary in some cases. Here you’ll find the product’s technical data sheet and the MSDS (or SDS).